The problem with birds isn't the birds, it's me. I love birds. We plant all kinds of trees, flowers and shrubs to encourage birds to visit us year round. I like watching them at the feeders. I marvel at their acrobatic dodging and diving. I like hearing their songs in the morning in spring and summer. I even like the way the turkey vultures around here clean up the road kill. Birds are in a word, amazing. My problem with birds started years ago when we lived in the suburbs. Our house backed up to a wooded area, and our extensive landscaping kept creeping further and further into the woods as the years went by. At some point, I decided to plant some spruce trees near the cottage garden on the east side of the house. They were lovely trees and every spring the robins would come and settle in our yard by the woods and build their nests in the spruce trees, which offer cover and shelter from the local predators. Unfortunately, the spruce tress were a little close to the garden beds, and when there were eggs or young in the nests the parent birds would get very protective, and at times, downright aggressive in their protection. They would dive-bomb Irene and I on the weekends as we worked in the garden. They'd come so close to our heads at times, I swore they were gonna collide with us eventually. I understand what was going on, and I would never disturb or destroy a nest, but to be honest, it pissed me off. We were minding our own business in our garden and they were taking hostile and aggressive actions against us, the people who planted the trees they loved so much. Eventually, I cut down the spruce trees. Problem solved. Then we moved to the country. The second summer we lived here, I bought a new garden tractor to cut the grass. I was so proud, cutting my lawn in half the time it took with the old, used beater I had purchased as an afterthought the first year. The lawn looked good and I didn't mind cutting 2.5 acres of grass each week. Then the barn swallows showed up. I'll never forget that first time. I was mowing the lawn and a couple barn swallows started swooping in towards me as I criss-crossed the lawn. They got nerve-wrackingly close at times, and I was actually ducking, fearing they were going to collide head on with me as I tooled across the lawn. The second time it happened, maybe a couple weeks later, I got off the mower and called Irene out to see what was going on. I didn't think it was my imagination, but I was a little sensitive to bird aggression from my previous experience, so I wanted a witness. She was as amazed as I was. There were a half dozen birds swooping and diving and doing acrobatic maneuvers in mid-air, in front of me and right above my head as I rode my tractor across the property. I couldn't believe my rotten luck. The first thing I did was check all the trees in and around the lawn to see if there were barn swallow nests nearby. Well, barn swallows like barns (doh!) and other man-made structures. So, not surprisingly, I didn't find any nests. Near the end of that second year I just happened to be wearing my glasses instead of my non-prescription sunglasses while I was out on the mower. The barn swallows showed up again and started in with their acrobatic 'Mike attack'. But this time, to my amazement, I could see clearly what it was they were really up to. As the tractor plowed through the grass, it stirred up frogs and bugs the whole way across the lawn. I saw a barn swallow dive down and nab a grasshopper in mid-air three feet in front of the tractor. I watched as moths, crickets and other bugs became lunch in the snap of a beak and beat of a wing. Truly amazing to watch...with my glasses on. Ever since then I've been at peace with the swallows. There is no maliciousness in their little hearts. It is a simple symbiotic relationship they have with me and my tractor. When I go out to mow the lawn I often call back to Irene as I step out the back, "I'm going to feed the birds!" This June, we spent a week in the Virgin Islands as my son got married on the beach on St. John. When we came home, we noticed that a pair of barn swallows had begun building one of their ingenious little mud nests on top of one of the drop down blinds we have on the porch. Not wanting to disturb 'Momma Bird', or any eggs that might be in there, I watched over the next week as she completed construction on the nest. Well, momma laid eggs, and stayed there religiously through some cold nights keeping then safe and warm, chicks finally hatched and then the amazing process of raising ugly little fuzz balls into graceful dive-bombers began. 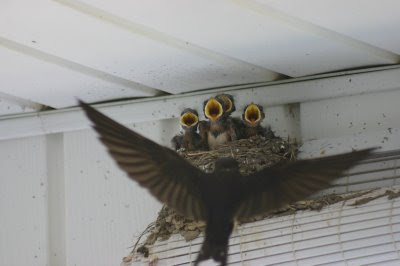 Of course, both mom and dad swallow were very unhappy if I ever ventured out on to the porch to enjoy my million-dollar view of the lake across the road, or took the direct path to work on the gardens out front. In fact, they were much more aggressive than any robins ever were. They'd come diving straight at me, letting out a blood curdling screech and getting so close I cold feel the beating of their wings. For the better part of the summer, including at night, I was not allowed access to my front porch, which is where I usually step out to see the weather conditions, since all our weather approaches from the west. It was almost worth it for the incredible close-up views we got of the raising of swallow chicks, mom and dad feeding them feet away from our window, and that first day when three of the four decided they could fly away, leaving their one poor chicken-hearted sibling alone for several hours. It was in a word--amazing. But mom and dad knew who I was. And they would make a point of attacking me whenever I went outside, even in the back yard! Even at night! Unfortunately, I couldn't cut down my porch. Even worse, while all this was going on, it became obvious that sparrows were taking nesting materials into the roll-off observatory through a small space leading to the tracks for the roll-off. By the time I figured out what they were up to, the track beam, cavity and roller wheels were packed with straw, grass, cloth, string and anything else the sparrows could use to make their nest. Not only did I not want to roll the roof off, crushing eggs or killing chicks, Irene made it clear that we would have serious issues if I even considered it. Summer dragged on, eggs hatched, chicks flew away, and eventually I got my porch and roll-off back. It's all a trade-off. I told you, it's not the birds, it's me. Next year--no birds allowed. I've learned my lesson. I am a pushover. I let tiny little birds, weighing ounces, rule my life for almost a whole summer. They kept me from my gardens and they kept me from enjoying my astronomy at times. I swear it won't happen again. Irene is chuckling to herself in the next room as I write this. She teases me all the time saying, "That's it, Big Mean Daddy has spoken!" One of the most unpleasant experiences I ever had is getting dive-bombed by magpies when I lived in Wagga Wagga in NSW Australia. It was only a five minute walk to the shop but during nesting season it was a very treacherous one as well. Some of the farming folk managed to survive by attaching an artificial face to the back of their hats which at least took the target area away from their face and supposedly was meant to trick the magpies into thinking they were facing their target face on making them think twice. I'm not so sure of that as I never tried it. In the end I just legged it as fast as I could. When I was a teenager living in Evandale Tasmania we had a problem with dive-bombing magpies walking between our house through the churchyard nextdoor. My Mum always made sure I had a hat and a rolled up newspaper to shake at the magpie and as a last resortt wave in the air as it swooped past. In the end all you can do is sit tight and wait for nature to take it's course. But man o man having it put a dampener on your astronomical activity would be the severest test of patience I could imagine. Thank you for posting this. I've just run into my house after being dive-bombed by 4 birds as I tried to mow my lawn. It was...disconcerting, to say the least, and more like downright frightening. You've at least explained WHY they're doing what they're doing, so I feel somewhat comforted that this isn't a scene from an Alfred Hitchcock movie!